Will the Tribulation begin on September 23, 2017 when we see the constellation Virgo with the sun rise directly behind it? Before I answer, let me remind you that all too often, mysterious theories emerge that grab the attention of prophecy students. In many cases, well meaning believers get caught up in the hype and are let down. That was the case in 1988 with “88 Reasons why the Rapture will be in 88” by Edgar C. Whisenant. It happened again in 2010 with the followers of Harold Camping and again with the four lunar eclipses during 2014–2015 that caused many people to anticipate the Lord’s return. Of course this did not happen. Now it’s happening again from a misleading interpretation of Revelation 12… and it’s gaining traction. Each time these date speculations occur, they end up giving Bible prophecy a bad reputation and a black eye. Now, with the popularity of YouTube, it’s much easier to propagate these ideas so they quickly take on a life of their own. Sadly, unsuspecting prophecy students tend to swallow it hook, line and sinker. So, just as I taught about each of those previous events, be aware of fanciful books and slick calculations that take ten wise men to debunk. The prophecy blogosphere is abuzz about a supposed event of great prophetic significance on September 23 of this year. Many videos on the internet are promoting this. 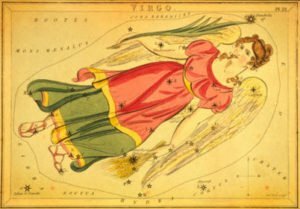 On this date, the sun will be in the constellation Virgo (the virgin), along with the moon near Virgo’s feet. Additionally, Jupiter will be in Virgo, while the planets Venus, Mars, and Mercury will be above and to the right of Virgo in the constellation Leo. Teachers are falsely claiming that this is a rare event (allegedly once in 7,000 years) and that it supposedly is a fulfillment of a sign in Revelation 12 to let us know the Lord is coming soon. Revelation 12:1–2 (ESV) reads: And a great sign appeared in heaven: a woman clothed with the sun, with the moon under her feet, and on her head a crown of twelve stars. She was pregnant and was crying out in birth pains and the agony of giving birth. Signs from Virgo in the Sky? So we have here a woman (Virgo) in the sky (heaven), along with the sun, and the moon at her feet. What about the 12 stars? Virtually all the websites promoting this prophetic sign state that there are nine stars in Leo, but with the addition of the three planets (which appear as bright stars), there will be 12 stars. Since Leo is to the upper right of Virgo’s head, one might see this as a crown of 12 stars thus fulfilling the sign described in Revelation 12, “and on her head a crown of twelve stars.” Did you get that? What Does Revelation 12 mean? Over the years, I’ve enjoyed studying Revelation 12 and have had the privelge of teaching it a number of times. It happens to be one of my favorite chapters and provides a unique perspective on the interaction between Satan and Israel, Satan and our world and Satan’s activities during the Tribulation Period. The language and context of Revelation 12 is to be taken symbolically not literally. The “woman with child” is a depiction of Israel who longed for the appearance of their Messiah. 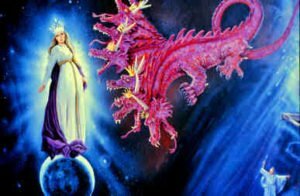 The Dragon in front of the woman portrays how Satan sought to destroy the Jewish people throughout the Old Testament in order to destroy the coming Messiah. The language used is never meant to be taken as a literal constellation. Nor does it ever tell us to be looking for it as a special sign-constellation announcing the soon return of the Lord in the end times. That is pure fantasy! What sort of prophetic event is this sign supposed to usher in? Clearly, most people promoting this have in mind the Lord’s return. Some explicitly state this, but others, mindful of the words of Jesus in Matthew 24:36 are hesitant to make that claim, though their implication is clear enough. Instead of setting dates, we ought to be ready for His return at any moment. Are you ready?